Light amber with thin head that has ok retention. A fair bit of citrus on the nose that is quickly followed up by some floral like hops and a nice tropical fruit smell. The down side of this is that it is a struggle to detect. Floral hops that match up with the nose & a slight fruity tang however there is little in this beer to make it stick out from the crowd any. Some bitter hops can be detected at the back end & there is a sweet tang to it but again it is not the strongest. Quite light but I wouldn't go as far as to say it is watery.There is good carbonation & a crisp, dry finish that is slightly too bitter imo. Average golden ale & one that struggles to stick out from the many others just like it. Sadly it is the weakest offering from the brewery I have tried to date. Starts with a frothy head, but settles quickly. Leaves some spots on the glass. The brew is dark straw and clear. A hoppy golden ale. The hop is more bitter than spicy. This lasts long after the swallow. Starts off (briefly) with a pale malt. Good body with a higher than expected carbonation. Light bodied golden ale with more bitter hops than average British bitters. Pours into a pint glass just a shade clouded golden wheat color with a thin fizzy head that collapses to a ring around the glass. Smell is bitter grassy and floral hops with some honey malt. First sip is a bracing but balanced hoppy bitter with honey malt. A bit light and fizzy on the tongue. Slightly sour in the finish. As the beer warms, malts a slightly more pronounced and a hair more grainy, but overall much more in the bitter ale family than anything approaching IPA. But there is a lot of flavor at this alcohol level. Would love to try this on tap or cask. A - Poured bottle into pint glass. Was an aggresive pour that produced a decent head, although it faded fast. Laing was absolutely superb though. Would probably get a 4.5 but the slightly cloudy yellow really reminded me of something else. S - Hops rushed through briefly but eased up quickly to reveal a good malty smell. T - Other way around from the taste, I felt a lot more malt up front followed by a resiny hop aftertaste. Fairly mild compared to most American brews although this was one enjoyable pint. Slight citrus taste present also. M/D - Definately a good beer, easy going. Great on a warm day. This beer growed on me as I went and it definately was a good session beer. Purchased from the Sainsbury's supermarket. Coming in the usual packaging of Williams Bros, slim 500ml brown bottle, BB DEC 2000(???? ), served cool in straight imperial pint glass. A: pours a light golden hue, coming with sporadic fizziness and a pure white cottony foam - looking very decent and inviting. S: lightly earthy/hay-ish yet deeply floral and grapefruit-zest-oily (with a salty-sour twang) at the same time, showing lots of hops at play on top of a much milder presence of lightly honey-ish malts. Clean and focused on the aroma overall, downplaying the maltiness in order for the hoppiness to roam - true to the style of a Golden Bitter. M&D: light-bodied, mildly spritzy, smooth and quite crisp as well for a golden bitter. 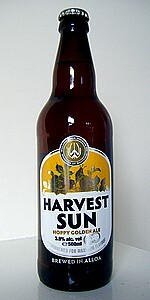 Although this is a decent beer in its own right, given so many Golden Bitters available on cask or in the bottle-conditioned form nowadays, this beer's flavour profile really makes it difficult to stand out from the crowd. A worthy entry ale for any lager-lout that should brave a change, though!